Lotions in the nail industry are used as manicure and pedicure service add-ons as well as retail products to help hydrate, rejuvenate, and soothe clients’ skin. They are often infused with various fragrances and anti-aging compounds to further enhance the benefits to the skin. But what is lotion really made of? Oil and Water: The base foundation of modern day lotions is two simple ingredients, water and oil. Typically the oils used in beauty lotions are organic ones like jojoba, sunflower, and other plant-derived oils, as well as synthetic oils refined from petroleum. Emulsifiers: Because water and oil do not mix, a special ingredient is used to ensure that the oil and water remain blended and properly dispersed throughout the bottle. These ingredients are called emulsifiers. A common emulsifier you might know is lecithin, which is found in egg yolk and used in lots of food products like mayonnaise. 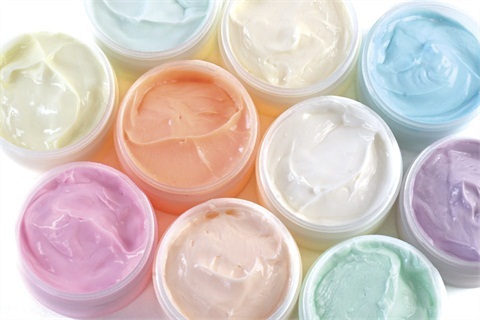 Stearic acid, emulsifying wax NF, PEG 40 hydrogenated castor oil, cetyl phosphate, glyceryl stearate, polyglyceryl-2-diisosterate and PEG-100 stearate are just a handful of the numerous emulsifiers commonly used in lotions. Preservatives: The beauty industry often uses organic oils in its lotions, but a problem is that without preservatives the organic oils will turn rancid over time. Vitamin E and vitamin C are two antioxidants that are often used to prevent botanical oils from becoming oxidized and thus turn bad. Other preservatives in lotions are used to prevent the growth of microorganisms such as bacteria, yeast, and mold. Some common preservatives in the industry include paraben, phenoxyethanol, ethylhexylglycerin, and methylisothiazolinone, but there are many more. Glitter: Humectants are products that promote water retention (hydration). They are the ingredients that help hydrate the skin. Common humectants are aloe vera, urea, glycerin, and honey. Check out the “lotion” entry on NAILS Encyclopedia, www.nailsmag.com/encyclopedia, for more articles about everything you’d want to know about lotions.